Christine Ward Phillips, a 2013 graduate of the college, has the full attention of twenty-four eight- and nine-year-olds in a colorful classroom filled with books, art projects, and small desks. She moves easily through the room, gently modulating behavior here and there to allow each child to be in the best learning environment. Her aptitude and skill as a teacher are readily apparent as she commands the attention of the children, enthusiastic hands shoot up into the air as she teaches a math class. Always interested in becoming a teacher, as a high school student touring Cazenovia College Phillips was impressed with the education program's curriculum. It included two semesters of student teaching—at both city and suburban schools—for a full year. She shares, "There were mandated hours in the classroom including six out of the eight semesters; that fact caught my attention." In addition to the opportunity to pursue the education program's course of study, Phillips had a visceral reaction to the college as soon as she walked on the campus. Starting the tour between Reisman and Hubbard Halls, she knew within five minutes that Cazenovia was the school for her. "I am from a small town in upstate New York—Canajoharie—and I knew that Cazenovia's small campus and surrounding village made it a good fit for me," says Phillips. Phillips quickly became immersed in college life, finding a good balance between the classroom and extracurricular activities. Serving as a resident advisor was especially important to Phillips during her Cazenovia College years, and a position she held as a sophomore, junior, and senior. Her husband, Matt Phillips '13, was a resident advisor as well, and residence-life staff remain close friends including Tiffany Varlaro, assistant dean for student life; Shannon Dobrovolny, director of residence life; and Rachael Clark '15, a former part-time area coordinator. "Matt and I were married on July 22, and our good friends from residence life were in attendance, along with my great friend and roommate Noelle Sippel '13 who was a bridesmaid," shares Phillips. Working as a resident advisor and pursuing a degree in education presented Phillips with the most challenging aspect of her college experience—working two different schedules for two semesters—sometimes until 2:00 in the morning on campus, followed by the elementary-school schedule of early work days. Nevertheless Phillips persevered, receiving a Bachelor of Science in inclusive elementary education with a minor in international studies. Her hard work paid off with the ultimate recognition as the valedictorian of the Class of 2013. Important faculty members to her Cazenovia experience includes former Professor Erica Miller, who Phillips met as a member of the search committee for Miller’s position. Phillips got to know Dr. Grazyna Kozaczka through the All-College Honors program; she inspired Phillips to get out her comfort zone with a vampires in literature class. Phillips is also friendly with professors Dr. John Livermore and Dr. Rachel Dinero outside of the classroom. "It is a Caz thing to interact with professors with whom you have not even had a class," imparts Phillips. A challenging academic endeavor for Phillips was working with former Dean Tim McLaughlin on the Great Minds/Great Ideas Lecture Series. She partnered with him on a presentation about W.B. Dubois and his struggle with racial equality, with a particular focus on the global experiences of the color line. As a junior, Phillips delivered the lectures with Dean McLaughlin at local libraries. Phillips's goal-driven academic performance continued through graduation. She started her master's in teaching—at the University of Pittsburgh (an online program)—in May of her senior year with finals and commencement going on at the same time. She took two summer sessions in 2013, finishing in April 2014, in just one year. At the same time, Phillips was working full time as a middle-school teaching assistant and waitressing part time. "Cazenovia College prepared me very well for my career, there was hardly anything new that I learned in my master's program that I hadn't already at least touched on while I was at Cazenovia." With a master's completed, Phillips interviewed in Rochester and Syracuse for teaching jobs. Her career began at Syracuse Academy of Science Charter School in a fourth-grade classroom. 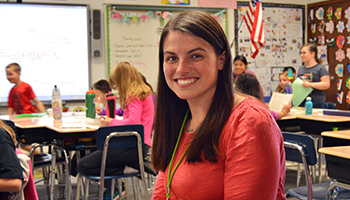 Eventually Phillips sought employment in the Fayetteville-Manlius School District, as she had completed some of her student teaching at the district’s Wellwood Middle School. Phillips took an interim position at Wellwood in fifth-grade and soon interviewed for a full-time position for the following year. Again, following her goals, Phillips secured a position at Enders Road Elementary School teaching third grade. Having recently completed her second year at Enders Road, Phillips shares, "I love teaching because every student is different, making each year of teaching unique."